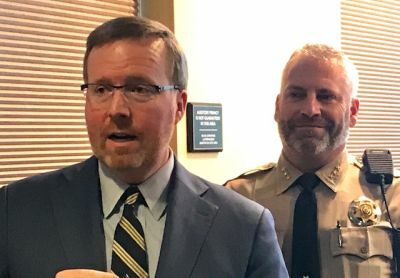 BEND, OR -- Deschutes County District Attorney John Hummel launched a new countywide initiative Thursday, designed to help low-level drug offenders get addiction treatment instead of jail time. Hummel calls it Goldilocks, "We're going to find the intervention that's just right for each suspect. We're not going to be too hot or too cold." Hummel says trying something new can be risky, but he feels the county has nowhere to go but up because the current system isn't working. "Somebody who's suffering from addiction, how do we get them into treatment? With 15 court hearings over a year's time; it took too long to get that person into treatment. Now with a drug dealer, at the end of a case when they only get 30 days in jail, we say, 'that wasn't tough enough.'" He says Goldilocks does away with the typical criminal justice response that treats all suspects the same. "Anyone who wants to defend the status quo needs to look at those recidivism rates. Because, with some exceptions - the family drug court being a notable exception - we need to do better. And, I'm confident that the medical system know how to improve people's health better than the criminal justice system." He says eligible offenders are given the option participate in a diversion program and in some cases could receive addiction treatment at a local community health center. Law enforcement will help identify eligible suspects who will be offered a chance to attend an orientation for the "Clean Slate" level of the program. "If they show up, their court hearing is removed from the docket and at that point, the person is in the medical system; they're out of the criminal justice system. When they're in the medical system, they have to participate in their care and not get arrested for a new crime. If they participate and don't get arrested, at the end of a year, the case is gone for good. If they pick up a new charge, that person has indicated that they need a little more incentive to get the help they need. So, we will then prosecute." That traditional prosecution model is the second level of Goldilocks. For the third level, Hummel says he will seek the maximum sentence for those charged with a commercial drug offense or for selling to a minor. Goldilocks is a collaborative effort between the D.A., local law enforcement agencies, drug treatment centers and community health clinics in Bend and La Pine. Hummel says for now, it's just a trial program, "If we see a significant reduction in recidivism rates, meaning people who go through this program re-offend at a significantly lower rate than people who go through the criminal justice system, than it's a success; then we're going to keep doing it, then we're going to look to expand it, then we're going to hope other communities also adopt it. If it doesn't work, then we're not going to keep doing it." Deschutes County received a grant from the John D. and Catherine T. MacArthur Foundation's Safety & Justice Challenge, as well as funding from the Bureau of Justice Assistance and the Association for Prosecuting Attorneys. Grants are for six months, but Hummel would like to try Goldilocks for at least two years before determining whether it's successful. 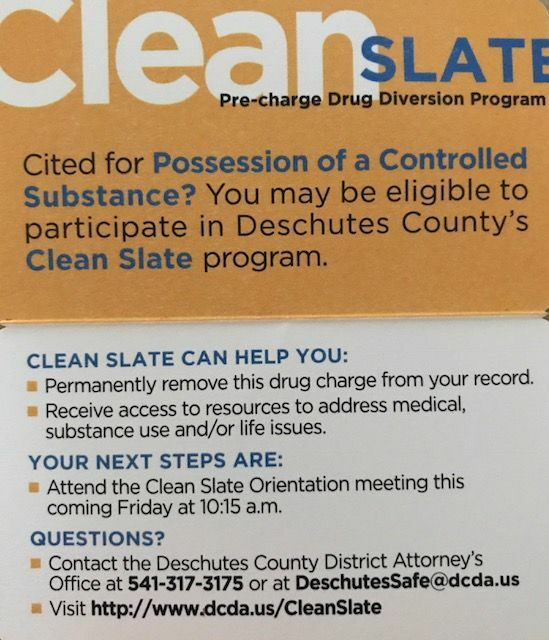 (right) Eligible offenders are given a "Clean Slate" card explaining the program.